The shot above is the final image after processing (the one originally posted in other forums). Click on the image to enlarge to it's full size. 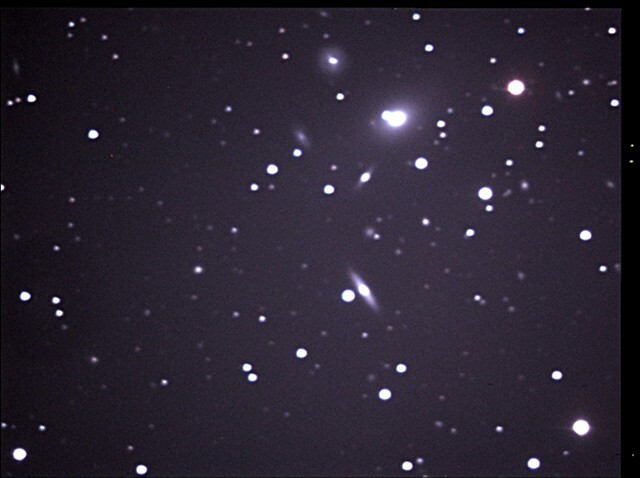 Taken with the 14" Celstron C-14 located at the RASC Calgary Centre's Wilson Coulee Observatory. The image was taken with a monochrom (B&W) imager. To get colour a total of four filters were used and then combined later. The luminance filter (L) is basically an unfiltered shot of the object which provides the overall brightness information. In this instance the L channel was made up of nine, 10 minute shots stacked together with software for a total exposure time of 90 minutes. The red (R), green (G) and blue (B) channels which provided the colour information were each made up of three, 10 minute shots stacked together for a total of 30 minutes of exposure per channel. The image covers a part of the sky that is 12.5x9.3 arc minutes or an area of about 116 square arc minutes. For comparison the full Moon is about 30 arc minutes across and has an area of about 707 square arc minutes. It can be seen that even the close galaxies are a long way away. The farthest ones are well over one and a half billion light years away (distances are computed from data tables available at the SIMBAD and VisieR databases). So it's possible for amateur equipment to capture images of objects far-far away. That being said the galaxies in the Hubble Deep Field are upwards of 10 billion light years away. The universe is a big place indeed! I've also included in the data table the visual apparent magnitudes (how bright they appear to us here on Earth). For comparison the bright star Vega has an apparent magnitude of about 0, the average person at a dark site with dark adapted eyes can see stars as dim as 6th magnitude. The dimmest galaxy captured is at apparent magnitude of 17.6. This is about 43 000 times fainter than what can be seen with the unaided human eye. Not bad for amateur equipment with relatively low exposure times!